The new Brinno TLC120A-BK takes the best features from our proven line of time lapse cameras, packs these features into a small pocketable cube and adds wi-fi, app control, weather resistance, instant sharing a rechargeable battery and more. 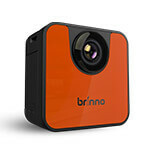 The TLC120A-BK is the first in an exciting new generation of Brinno cameras. Perfect for travel, education, research, remodeling projects and daily fun.